Anthuriums (Anthurium spp. ), also called spathe flower and flamingo flower, are native to the rain forests of the tropical Americas. The colorful and exotic-looking flower bracts are the plant's signature calling-card, standing out against the deep green foliage. Typically grown in containers, even in warm climates, they bring a tropical look both indoors and outside. Herbaceous perennial evergreens belonging in the Araceae family with over 800 species, gardeners are more likely to find cultivars of Anthurium andraeanum and hybrids, Anthurium hybrida, when shopping for the plant. Crossbreeding Anthurium andraeanum and dwarf types, like Anthurium amnicola and Anthurium antioquiense, results in smaller and more compact plants, which make suitable plants for containers and cut flowers. Depending on the cultivar, flamingo flowers typically grow 1- to 2-feet tall and wide. Foliage is heart-shaped, with long-stemmed leaves growing up to 8-inches long, rising in clumps from the plant's center crown. Flowers have a distinctive structure composed of the spathe, or modified leaf, which is the portion of the flower that holds the color, and the spadix. Spathe colors are varied and range in colors of reds, pinks, purples, orange and white. The waxy flowers are anywhere from 1- to 11-inches wide, bloom year-round and last eight to 10 weeks, making them popular with florists. Sensitive to frost, flamingo flowers will only grow planted outdoors in the ground in the warm, frost-free climates located in USDA zone 10, that's why you usually see them growing in containers. When winter comes calling, you can bring the containers indoors to a protected location. Bring anthuriums indoors when temperatures drop to 60°F and below. Plants grown in frost-free climates and planted in the ground need some basic requirements met for healthy growth and the production of flowers. By following some basic tips, the plant should be a hardy performer in the garden. Grow in a location that receives partial sun for the best production of blooms. Growing flamingo flowers in full-sun will cause leaf-scorch and it will not produce many, if any blooms in a full-shade site. Soils should be high in organic matter, but well-drained. 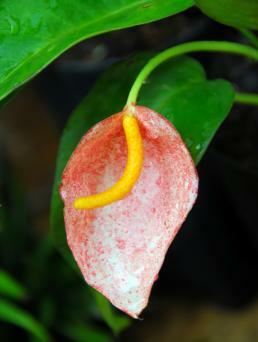 Anthuriums can rot if planted in constantly soggy soils. If your soil retains water, create a raised bed to grow the plant. Allow the soil to dry slightly before watering and then thoroughly saturate the roots. Mulching around the plant helps the soil retain moisture, but do not cover the crown with mulch or soil or it will rot and die. Whether you are placing the container-grown flamingo flowers outdoors or growing it indoors, there are basic requirements that need meeting for proper growth. Properly potted and grown anthuriums live for years in containers and are relatively problem-free. Use containers that have bottom drain holes. Containers that do not drain retain water and the plant will rot. Fill the container with a peat moss based soil mixture that drains well. Do not cover the crown with soil or it will rot. Place indoor containers in a location that receives high light but not direct sunlight. Outdoors, place the container in a partially shady or partially sunny location, out of full-sun. Water when the top inch of soil inside the container feels dry and until it runs from the bottom of the drain holes. Layering the top of the container's soil with sphagnum moss helps retain the soil's moisture. Provided flamingo flowers grow in their preferred soil, light, and temperature conditions, they require relatively basic care. Plants can be prone to a variety of pests and diseases, which are usually due to improper growing conditions. 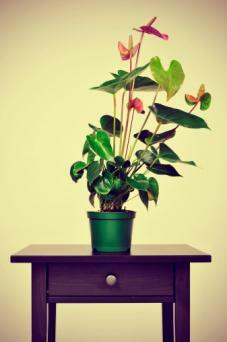 All portions of anthuriums are poisonous, so be sure to keep them out of the reach of children and pets. Fertilizer: Apply a houseplant fertilizer every other month during the growing season that is high in phosphorus (middle number) to promote blooming. Salt from the fertilizer can build up in the container's soil, so flush with water every few months. Water until it runs from the container's bottom drain holes. Pruning: Snip off dead foliage and flower bracts with sanitized pruning tools so you don't spread disease. Wipe the pruning tool's blades off with alcohol and allow to dry completely before using. Repotting: The plants grow and flower best when the roots are pot-bound. Repotting is only necessary about every two years. Humidity: Indoor-grown flamingo flowers require a humid environment for proper growth. Fill a spray bottle with room temperature water and spritz the entire plant once each week. Outdoor plants receive enough humidity from the environment. Water: Do not over water because it can cause yellowing foliage, root rot, and fungus gnats. Indoor conditions: To prevent tip burn, keep the plant in a location that doesn't experience extreme fluctuations in temperatures and out of drafty areas. Common pests that can be problematic to flamingo flowers are fungus gnats, spider mites, mealybugs, whiteflies, thrips, aphids and scales. Soil conditions that are too wet, promote pest problems, so the best course of action is to maintain proper moisture levels. If pests become a problem, the safest course of action is to spray them off with a strong stream of water or wipe them from the plant. Insecticides can damage their flowers, so use caution if reaching for one and make sure you follow specific instructions for its use. Most disease problems are due to soils kept too wet, which creates problems of rot, blights and leaf spots. Preventing these problems is as simple as making sure the soil the plant grows in drains well and isn't consistently too wet. In severe cases of rot, the flamingo flower will collapse and die. Keeping the area around the plant cleaned of dead leaf and flower debris helps contain any problems. Prune away dead foliage and flowers and don't let them fall and rot at the plant's base. Rhizoctinia is a common disease of anthuriums grown in wet soils when outdoor conditions are hot and humid. Controlling the weather is impossible, but you can control the too wet soil conditions to help prevent the disease. The disease is also controllable with fungicides, but be sure to follow the label instructions for use. 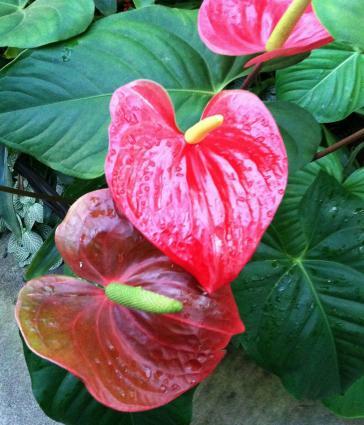 For years, and before hybrids became so common in the marketplace, the deep red flowers of Anthurium andraeanum were the plants found in garden centers. However, many varieties not commonly seen still offer an exotic look to frost-free gardens and containers. Anthurium scherzerianum thrives as a houseplant when grown under proper conditions. Plants are compact, slow-growing and average 2-feet tall and wide. Dark green foliage compliments the 3-inch flower bracts that range in colors of red, white, rose and salmon. Anthurium hookeri is grown in sheltered tropical gardens and used as a foliage accent plant or as a specimen in large containers. 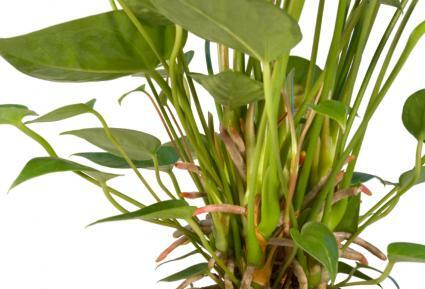 The plant's leaves grow approximately 12-inches wide and 8-inches long, with insignificant flowers. It requires a location with high humidity, rich, and most soils. Anthurium scandens is a trailing variety of that grows 2-feet long and works well grown inside containers or hanging baskets. Its 3-inch foliage is oval with tapered ends. Greenish flower bracts are small but fragrant and small lilac berries follow the blooms. Anthuriums brighten any indoor location with their deep green foliage and distinctive blooms and work well as a focal point on the center of a table. To highlight their various flower colors, experiment with different colored and bold containers. For example, use a black container to add emphasis to deep red varieties. You can also mix other tropical plants with similar growing requirements into a large container with flamingo flowers. Wherever you decide placing the anthurium, it's sure to bring attention to itself for years to come.